(Bloomberg) -- A team of scientists, some of whom have worked for Elon Musk, outlined a way to rapidly implant electrical wiring into the brains of rats. The process, described in an unpublished academic paper, is an important step toward a potential system to plug human brains directly into computers. The paper’s five authors have been employed by or loosely associated with Neuralink, a small and secretive brain computing startup founded by Musk, according to people familiar with their work and public information. Some of the research predates the formation of the company, and there is no mention of the scientists’ affiliation with the billionaire in the paper, which was posted last month to an online repository for academics and hasn’t been previously reported. Still years away from possible human testing, the paper shows a path forward to monitoring—and potentially stimulating—brain activity with minimal cranial harm. That could enable a company like Neuralink to one day build a device with artificial intelligence that people could access with their thoughts. Still, such a business may find it difficult to locate customers willing to undergo surgery to remove a chunk of their skulls. To start, the science community sees promise in a version of the technology that could treat patients with Parkinson’s disease, memory loss or other ailments of the brain. The U.S. Defense Advanced Research Projects Agency provided financial support for the research. The agency, DARPA, is known for its role in forming the internet and GPS. For the rat-brain project, DARPA awarded $2.1 million to the University of California at San Francisco, where the bulk of the work was done in conjunction with a lab at Berkeley. 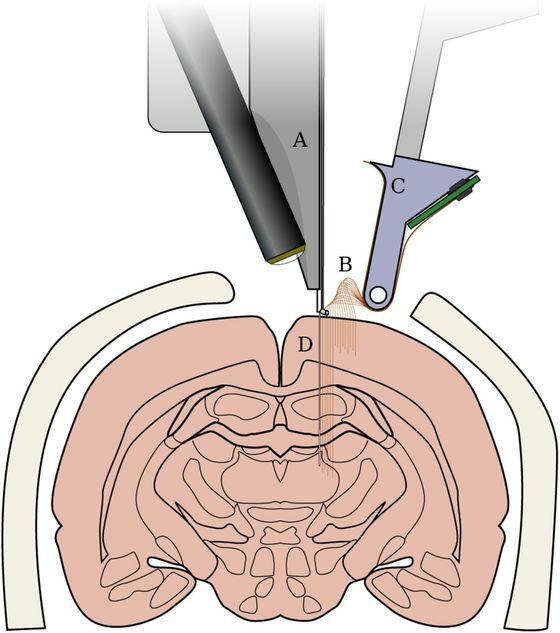 “Although more research is needed to refine the overall interface system and better integrate its components, these developments may ultimately open the possibility of bundling next-generation robotics, AI software and electronics to create alternatives to present-day neurosurgical techniques,” Justin Sanchez, the director of DARPA’s Biological Technologies Office, wrote in an emailed statement. Scientists have been working for years on ways to place electrodes in the brain while causing as little damage or inflammation as possible. One major challenge is crafting highly flexible electrodes that can move with the brain but are rigid enough to be inserted in just the right spot. Mackenzie Mathis, a researcher who studies rodents at Harvard University’s Rowland Institute, compares the problem to injecting cooked spaghetti into Jello. The new study is “a big step in the right direction,” said Mathis, who’s unaffiliated with the paper. The sewing machine employs a novel technique to solve that challenge. It uses a stiff needle to insert a bendable and thin polymer electrode, just a few millimeters in length, deep into the brain. The machine injects an electrode every few seconds, much faster than alternative methods. Attached is a small circuit board, which sits on the back of the rat’s head and records signals from the brain. In the paper, scientists detailed their work with adult, male, Long-Evans rats, a common test subject in labs. In one case, a rat with two dozen implanted electrodes was monitored for two months. Other rats’ implants didn’t last as long. Sometimes tiny circuit boards glued to the top of the rats’ heads simply fell off after a few weeks. There are other drawbacks. Electrodes from the sewing machine aren’t as thin as those used in experiments by other labs, the researchers wrote. The thinner they are, the harder it is to get them into place. Also, the experiments sometimes caused minor tissue damage. Neuralink was registered as a California medical research company in 2016 and has operated furtively since then. Musk’s involvement was revealed by the Wall Street Journal in March the following year and confirmed by Musk in an interview with the blog Wait But Why a month later. The company has hired away several high-profile neuroscientists from various universities and contracted with a laboratory at the University of California at Davis to conduct research on primates. As unpleasant as brain probing may sound, the findings could help scientists better understand life’s most enigmatic organ. Musk said in his interview with Wait But Why two years ago that he hoped to achieve a technical advancement that would help treat severe brain injuries by 2021. Beyond that, the science could expand the capacity of the human race, according to Musk. He gave an example where people could communicate complicated concepts telepathically. “You wouldn’t need to verbalize unless you want to add a little flair to the conversation or something,” he said.